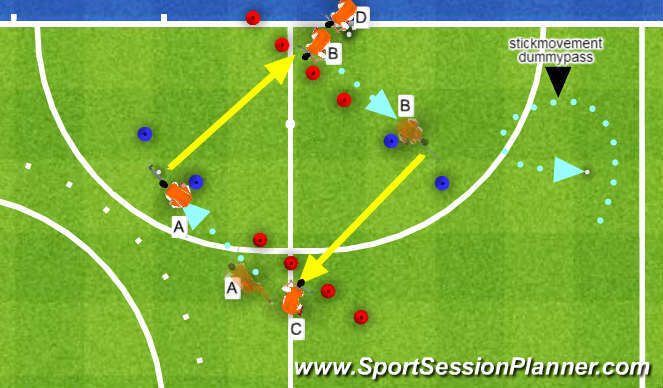 Structure: (B) Same as exercise (A) but when A is dribbling towards the blue cones B moves to the left or right goal. A passes to B. B receives and does the same thing passing to C who moved to the right or left goal. etc. B chooses side before the passer has received. Make the goals bigger or smaller. Structure: A dribbles towards the blue flaps and gives a sweep bh pass through the flaps to B who is standing behind the middle goal. B receives and does the same thing passing to C, C passes to D etc. Let the kids try with left and rightfoot in front so they can feel what works best for them. Rotation: Follow your ball. When you have 5 kids or more in the exercise play with 2 balls at the same time. Pointers: Use a wide grip. Keep your hands a bit above the ground so you will hit the ball in the centre to make it a low pass. Give the ball a short powerful punch. No follow through because the ball can end up in your hook that way. 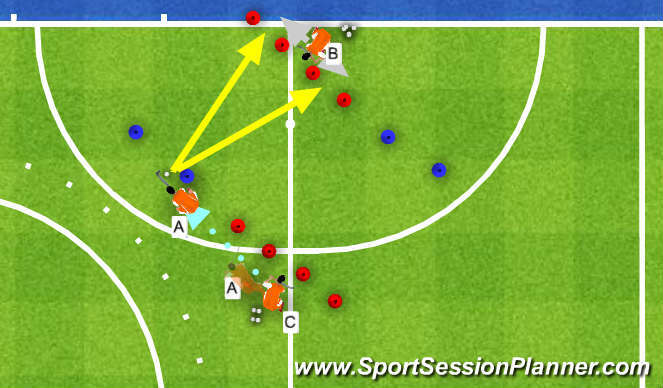 Variation: Make a dummy-pass faking passing to the left. (see drawing). Change of grip the other way, threequarter turn instead of onequarter.